Launched this past summer, Beme is a new video-sharing app envisioned by viral YouTube filmmaker Casey Neistat and realized with the help of Matt Hackett, a former VP of Engineering at Tumblr (VanHemert). Neistat, who gained popularity through his cleverly filmed DIY YouTube videos, as well as with his marketing collaborations with Nike, Mercedes and J. Crew, (Tepper), has long been enthusiastic about emergent media platforms and commands large followings on Instagram and Snapchat. Social media, it’s supposed to be a digital or virtual version of who we are as people. Instead it’s this highly sculpted, calculated, calibrated version of who we are. Told through filters that make our eyes bluer and carefully selected images to portray a version of who we are that doesn’t really resemble the reality of things (Neistat, Casey). 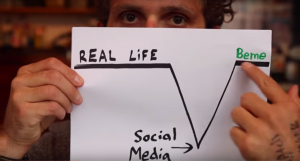 Beme is Neistat’s response to the failings and shortcomings of Instagram. Specifically, it provides users the ability to honestly share their true personality while simultaneously remaining immersed in the moment. As Hackett explains, “It was tricking you into sharing what you were doing without having to think of it as blogging. That’s what we’re doing here”(Isaac). While obviously indebted to Snapchat’s architecture and adopting its emphasis on immediacy and raw narratives, the utilization of the proximity sensor reorients user experience and its underlying ethos reverses trends of other popular platforms that stress extensive image enhancement. Beme is situated at a nexus of numerous debates and contexts within new media and technology studies. Primarily, Beme is located between the blurring boundaries of digital and real life, balancing social media’s performative dimensions and our increasing proclivity to share and record. Beme renews media studies’ continued interest in, “how users post, view, retrieve and interpret each other’s information as forms of online interaction, identity construction and performance, and computer-mediated communication”(Good, 560). Beme invokes many questions and inquires. First off, Neistat avoids the sempiternal problematic of what it means, in a fundamental sense, to access the ‘real’ and in doing so bypasses concerns regarding what authenticity or truthful expressions are. A further problem is the inherently performative presence of a camera lens, which goes unaddressed by Neistat. However, the mechanisms that Beme uses to achieve honest sharing provide the most fertile canvas for discussions regarding archiving, real-time documentation and authorship. Applications like Beme and Snapchat are reshaping traditional understandings of archiving on digital platforms. Recent media research positions these emerging digital platforms in a continuation of scrapbook and archiving traditions from the print era. As Good mentions, “Historians have likened scrapbooks to personal web pages and online photo albums, and it is common to encounter websites and software programs that play on the idea of the ‘digital scrapbook.’”(Good, 558). Applications like Beme adopt certain archival qualities, like documenting social interactions, but incorporate other, seemingly opposing traits such as impermanence and transience, which complicate our understanding. These “ephemeral social media applications” are eliciting a, “growing interest in platforms that are designed to erase communication artifacts after a short period of time,”(Bayer, Joseph B., 4) and continuing critical research on these platforms will, “contribute to our evolving understanding of ephemeral social media and their role in social relationships (Bayer, Joseph B., 2). 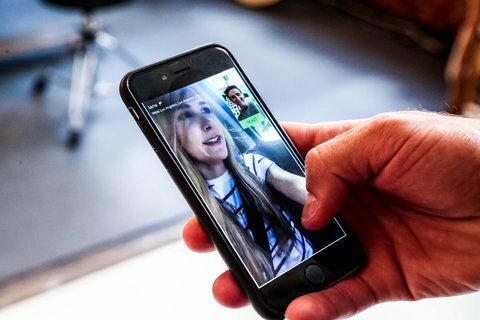 As well, while Neistat praises his app’s “liberating“ potential, it continues an emerging trend that increasingly succeeds more and more authoritative control to computation. Services like Netflix and Spotifty are more and more regulating our media consumption, conveniently searching and identifying films and music we might enjoy. Though not through algorithms, Beme similarly appropriates photographic and distributive control over our online photographs. Consequently, Beme functions in a way that nearly eschews or subverts authorship and agency by literally allowing users to take photos and videos blindly. Mirroring Instagram and Snapchat, Beme satisfies our strong desire to continuously and indiscriminately share photos, yet, uniquely facilitates this yearning to connect without the tediousness of actually taking the time to take a photograph and send it. Beme introduces an interesting development into online media platforms, especially its extension of automation into the sphere of friendships and personal relationships. For now, we will have to wait and see how the app will develop, as Beme slowly integrates itself within the existing social ecosystem and users continue to experiment with the app’s innovative software and technology. Bayer, Joseph B. et al. “Sharing the Small Moments: Ephemeral Social Interaction on Snapchat.” Ann Arbor 1001 48103. Print. Good, Katie Day. “From Scrapbook to Facebook: A History of Personal Media Assemblage and Archives.” New Media & Society 15.4 (2013): 557–573. Print. Isaac, Mike. “Casey Neistat’s Beme Is a Social App That Aims to Replace Illusions With Reality.” Bits Blog. N.p., n.d. Web. 13 Sept. 2015. Neistat, Casey. “Meet Beme.” YouTube. YouTube, 17 July 2015. Web. 13 Sept. 2015. Tepper, Fitz. “A Week In, Casey Neistat’s New App Beme Has 1.1M Videos Shared.” TechCrunch. N.p., n.d. Web. 12 Sept. 2015. VanHemert, Kyle. “Beme Has a Problem: Authenticity Is Boring.” WIRED. N.p., 21 July 2015. Web. 7 Sept. 2015.